On Tuesday, June 19, EDCOE team members enjoyed a free farmers’ market. 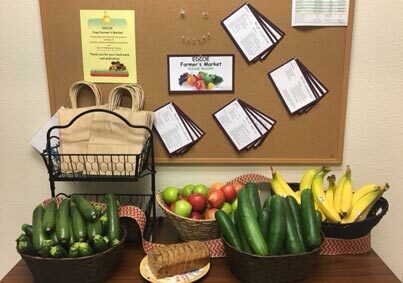 Thanks to a grant from CVT for EDCOE’s Wellbeing Program we were able to provide fresh produce to EDCOE staff. The farmers' market was designed to focus on employee wellness, sparked by discussions with our safety/Wellness Committee. Tables were set up in the EDCOE lunchbox, at Transportation and also at SELPA. In addition to produce there were also samples of a healthy version of zucchini bread and gluten free apple crisp as well as recipe ideas.